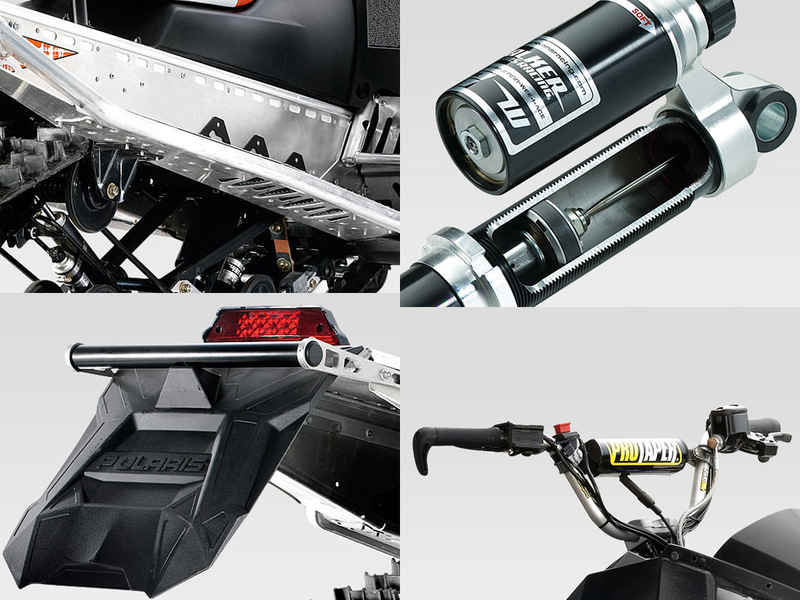 From Polaris, "The weapon of choice for backcountry freeriders and hillclimb racers is back and better for 2013. The Switchback Assault can run the logging roads or head for the trees. 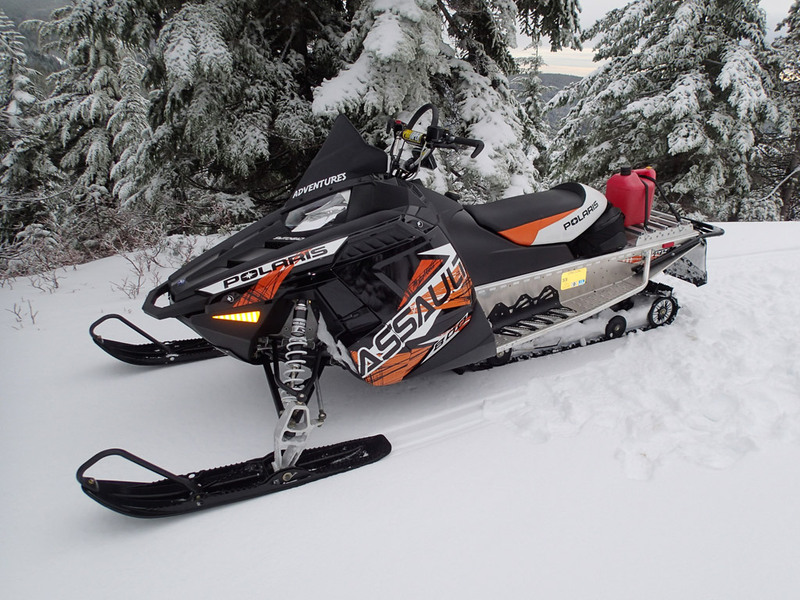 Deep snow flotation with trail gearing and the race-proven IFS for lighter steering effort." The 2013 Polaris 800 Switchback Assault 144 features ProTaper handlebar, right hand controls, 800 cc liquid-cooled Cleanfire® engine, aluminum bumper, optional security system, Walker Evans® needle shocks, Hybrid&trade: running boards and a 144" uncoupled skid. Standard equipment includes: reverse (PERC), handle bar hooks, hand and thumb warmers, mechanical fuel gauge, and digital MFD (speedometer, tachometer, temperature, etc.). 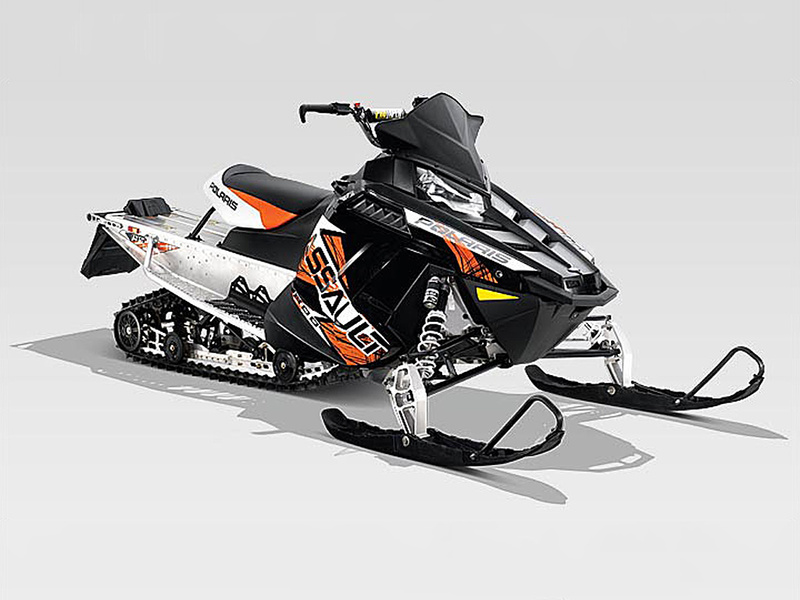 The international model includes a 2.0 inch lugged track, gripper skis, and electric start. Track: 15" x 144" x 2.0"
After riding an old 2002 Polaris 500 RMK snowmobile for two seasons, I felt it was time for an upgrade. 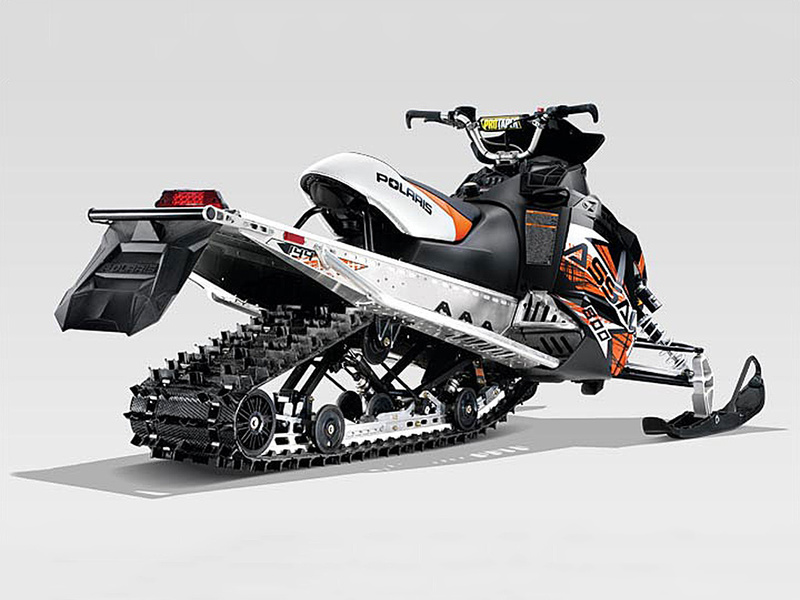 After lots of research I purchased a new 2013 Polaris 800 Switchback Assault 144 snowmobile. I had been going back and forth between the Switchback Assault and the PRO RMK. I ultimately settled on the Switchback Assault because of its added versatility of being a decent trail sled as well as a mountain sled. And being a lightweight guy, the 144 inch track and international model options should provide plenty of flotation in deep powder. Being an Oregon State alumni, I love the black, orange, and white color scheme on the 2013 Switchback Assault. While it probably won't make me a better rider, at least I'll look good out in the snow. 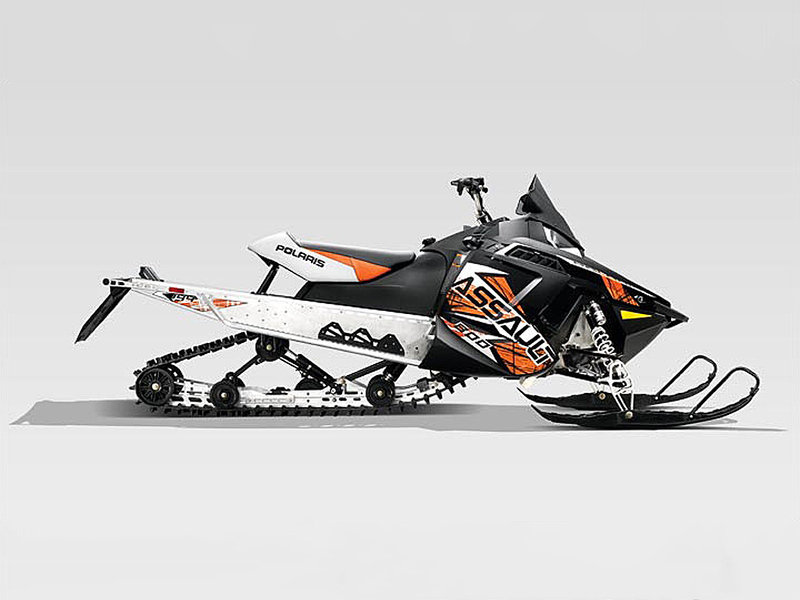 The 800 Switchback Assault snowmobile is a huge step up from my old sled. It feels larger and more powerful than my 500 RMK yet it is about 17 pounds lighter. I like the way it feels and how the controls are set up. The electric start is convenient even though it carries a weight penalty. The electronic reverse is slick. While I was recovering from knee surgery last month, I needed to push the snowmobile further back in my garage, but couldn't. I fired it up, hit the reverse button, listened to the engine nearly stop as the reverse kicked in, and then easily backed the sled where I needed it. That will be a welcome feature out on the trails. While patiently waiting for winter to come and my knee to heal, I have added a few accessories to my 2013 Polaris Switchback Assault snowmobile. I installed a 12-volt receptacle so I can charge my phone or GPS. I used the Polaris kit, but could have saved money installing an off-the-shelf receptacle from the auto parts store. The installation was a pain because I had to remove the hood to drill a hole and install the receptacle all while only being able to use one leg. Talk about a balancing act. I also added the E-Series Backcountry underseat bag by Sled Solutions. It adds tons of space in the unused area under the seat. I custom built an aluminum cargo rack to keep gear off the tunnel, which is an integrated heat exchanger. I also swapped the aluminum rear bumper for a steel receiver hitch bumper so I can tow a cargo sled. Last, I added a skid plate and mountain bar and will soon replace the front bumper with Polaris' Pro-Ride Ultimate front bumper. 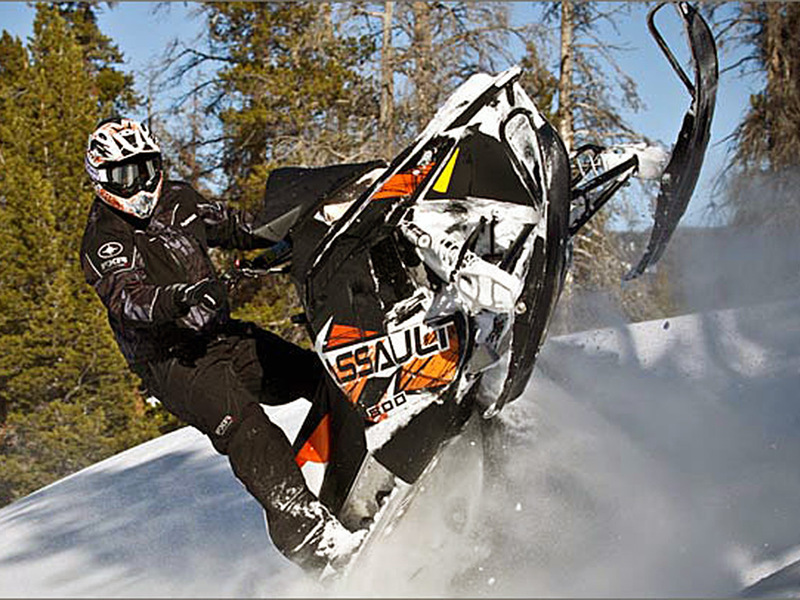 The 800 Switchback Assault should be an awesome snowmobile and I look forward to the first snowfall. We finally received our first snowstorm down at pass levels on Mt Hood giving me the opportunity to take my 2013 Polaris 800 Switchback Assault snowmobile for a ride. While I would have wished for more snow, it was better than nothing. The first thing I noticed was how much more comfortable and fun to ride the 800 Switchback Assault is compared to my old 2002 Polaris 500 RMK. But that is to be expected from a new sled. The suspension feels perfect, but I am sure I can adjust it even more to my size and riding style if I so desire. I found the 800 Switchback Assault to be very agile and easy to maneuver (if not too easy at times). I am not a great rider, but I felt more confident and daring on the new Polaris 800. 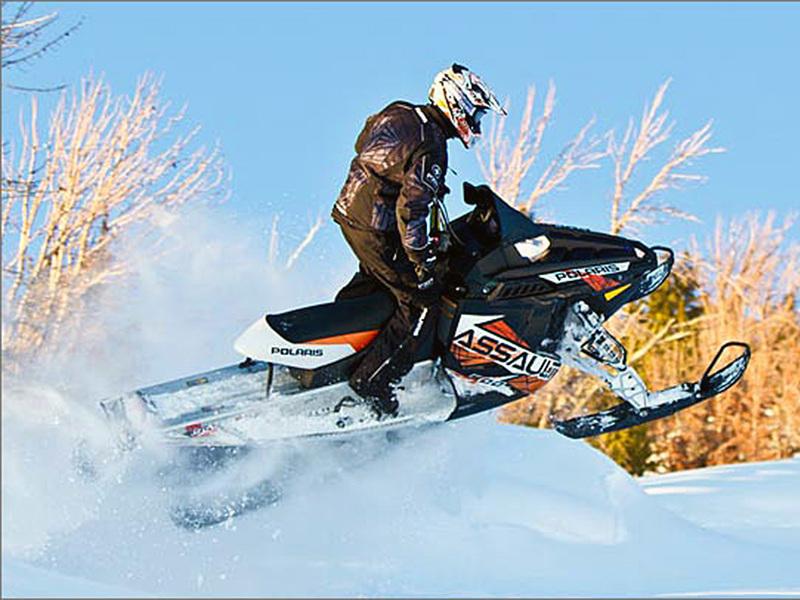 The 2013 Polaris 800 Switchback Assault has plenty of power. Whenever I needed a little more juice to get up a hill or get over/around an obstacle, it was there instantly. Throttle response is great. I like the ergonomics and location of most the controls except the hand/thumb warmer and computer buttons. They are often too hard to use while riding. I found I had to slow way down and take my eyes off the trail. I wasn't able to get off trail this trip, but look forward to later this winter. On trail the 800 Switchback Assault performed flawlessly. I just might become a better rider on this snowmobile! See Badger Lake and Bonney Meadows adventure where the 2013 Polaris 800 Switchback Assault 144 snowmobile was used.